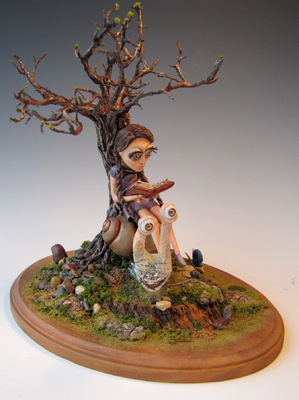 Super Sculpey, air dry clay, flocking, rocks, false eyelashes, wood, wire, resin, acrylic paint. About 7 in X 13 in X 10". Plasticine. About 9 in X 12 in X 9 in. Super Sculpey, wire, resin, found parts. About 3 in X 2 in X 4 in. Polymer clay. About 1 in X 1 in X 1 in. Polymer clay. About 1.5 in X 1 in X 1 in. Polymer clay. About 9 in X 9 in X 7 in. Air dry clay, polymer clay, glass beads, resin, modeling paste, false eyelashes, frames, and acrylic paints. About 11 in X 14 in. I'm a Supernatural fan. This is polymer clay and acrylic paint. Polymer clay, resin, acrylic paint, metal ring base. Air dry clay. 1 in. Polymer clay, resin, acrylic paint. About 5 in X 6 in X 2 in.